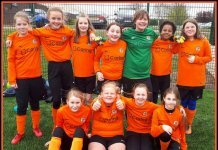 A match which swung one way and another right to the final whistle for Rugby’s u10s Girls. It was quite noticeable that Rugby had been away from a match environment for a while as they were very slow off the mark in everything they tried to do. The Coalville team were a very different side to the one we played last year and they started off the better team creating quite a few chances. Rugby gradually started to pull themselves back into the game with Melissa causing havoc in the Coalville defence with her pace to lay on quite a few goal mouth chances but everything remained pretty even between the two sides come half time. Jenna pulled off some good stops to keep it this way with Rosie and Katie being the pick of the defenders in the 1st half. 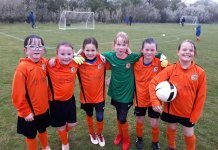 Having a full squad, Rugby u10s Girls rolled out changes prior to and after half time. 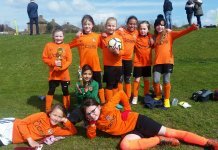 Rosie took over in goal and Holly, who had a splendid game alongside the marauding Marley took over the defensive duties with Madi, Lila, Poppy, Lois and Melisa came on to allow a reshuffle to the midfield and defence which allowed Jasmine to play upfront with real effect. It was a great match to watch unless you happened to be one of the coaches, so plenty of work to do this Friday girls !!!! !.